Both of these recipes originated in Keo’s Thai Cuisine (1986) but I’ve modified them enough (and provide annotations) to feel comfortable sharing them here. Thai Sweet Sticky Rice [Look for it in an Asian Grocery. You can substitute regular rice or a bed of chopped cabbage, but the sauce this dish makes is simply delicious with sweet sticky rice.] 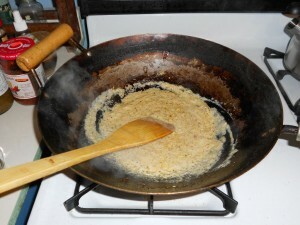 Your rice should be all cooked and ready to eat before you start cooking the chicken. 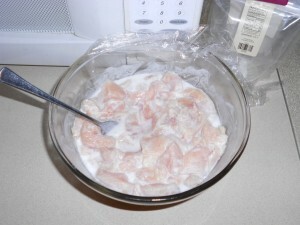 Cut chicken into thin strips. Pour about 1/3 c. coconut milk over the chicken and allow it to marinate while you get everything else ready. 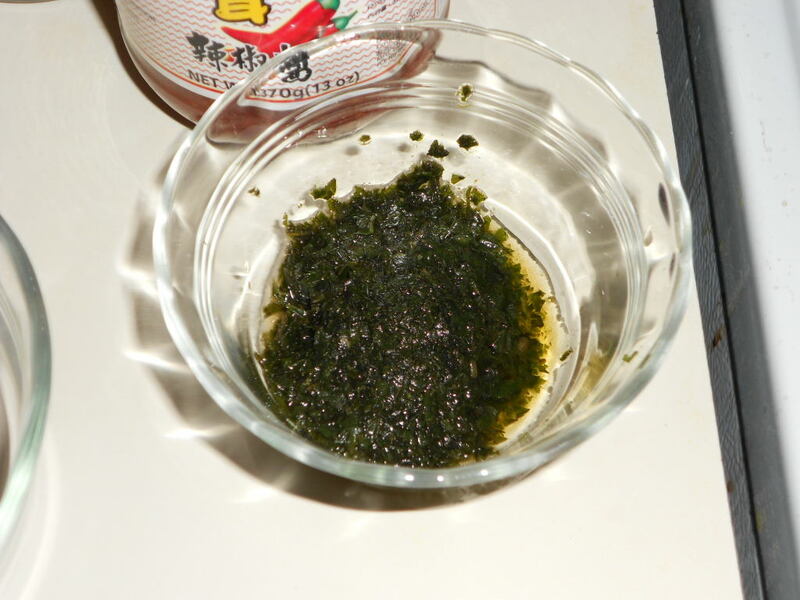 Heat oil to medium-high and saute the pepper/lemon grass/lime leaves mixture for 2 minutes. 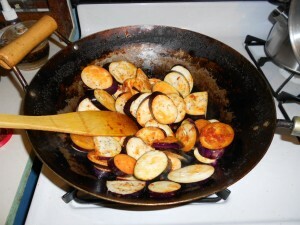 You want it to soften and release its flavors, but not burn or brown too much. 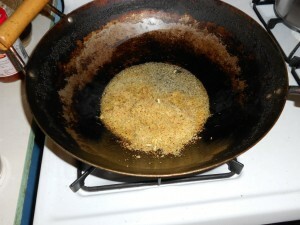 Add about 1/4 c. coconut milk and stir to blend, about 1 minute. 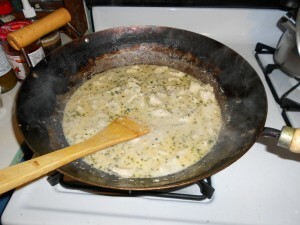 Add chicken in its coconut milk marinade. 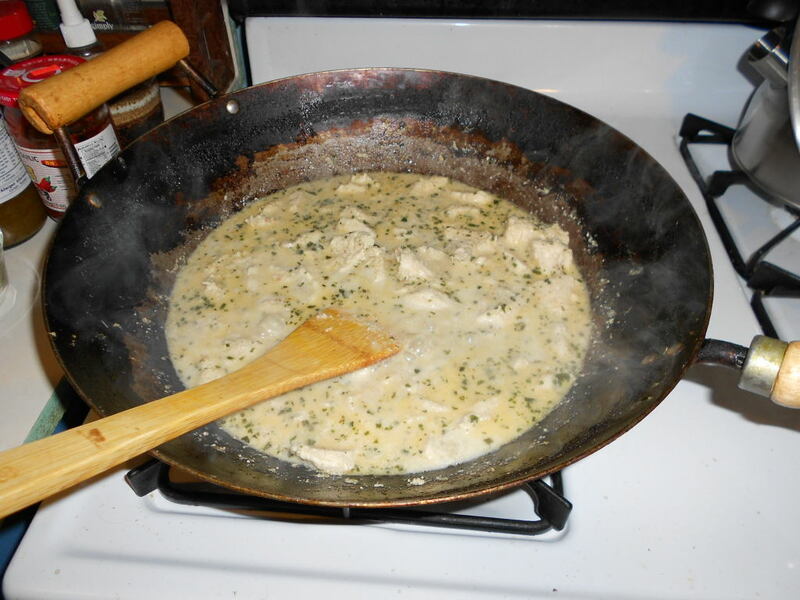 Cook for 5-7 minutes or until chicken is no longer pink. 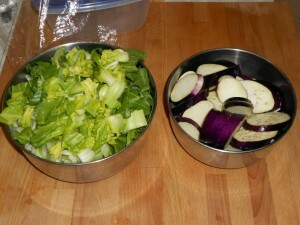 Reduce heat to medium-low. Add in a bit more coconut milk (if desired). Stir in fish sauce and basil leaves. 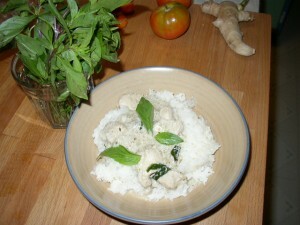 Serve over Thai Sweet Sticky Rice. 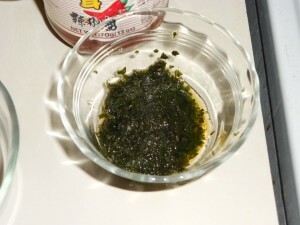 My local Asian grocery often runs out of Thai Basil before I can get there, so whenever I am lucky enough to get a bunch (which is usually much more than I need for a recipe) I make “Thai Basil Cubes” with any extra: clean and stem the basil leaves, combine with a little water in a food processor, pulse/chop, spoon into ice cube trays, freeze, transfer to a ziploc bag. Most of the pictures above are from yesterday, when I had to thaw a handful of basil cubes, strain, and add the leaves to the dish. Most of the pictures above are of a double-batch of the recipe (enough to feed 6-8). The recipe as written is what I usually make; I get four meals out of it when combined with the recipe below for Eggplant & Bok Choy. Heat oil over medium-high heat in wok. 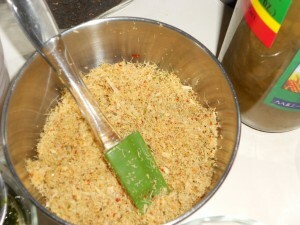 Add chili paste with garlic. (Careful, it will splatter.) Add eggplant and cook for 3-4 minutes, getting all the slices coated with the oil/chili paste. 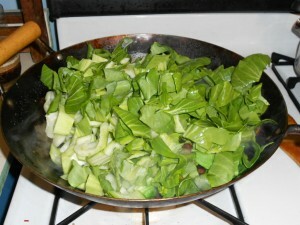 Add bok choy or broccoli, stir to coat. Cover and cook/steam for 5-7 minutes. Add yellow bean sauce, stir to coat. Just before serving (when all the vegetables are cooked) add basil leaves. Serve immediately over Thai Sweet Sticky Rice. 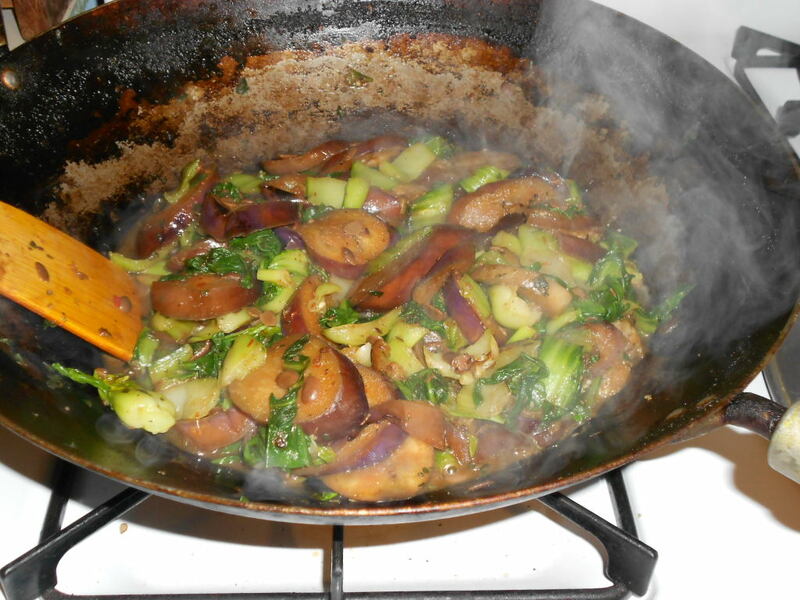 The original version of this dish used 1/3 pound boneless chicken breast, thinly sliced, cooked with the eggplant (rather than the broccoli). It also used crushed garlic and red chili peppers instead of chili paste, but it was difficult to avoid burning the garlic, thus my substitution of chili paste with garlic. This dish works well with Evil Jungle Prince with Chicken. * Do be certain to read the ingredients on any of the Asian sauces used in these recipes to verify that they are gluten-free/corn-free/dairy-free as you require . . . I’ve been able to find brands that seem “safe enough” for me, but none of them are labeled “gluten-free” (and no one is required to even acknowledge when their ingredients are “derived from corn”) . . . use your own judgment and substitute where necessary. Feel free to post substitution questions and comments in the comments below. 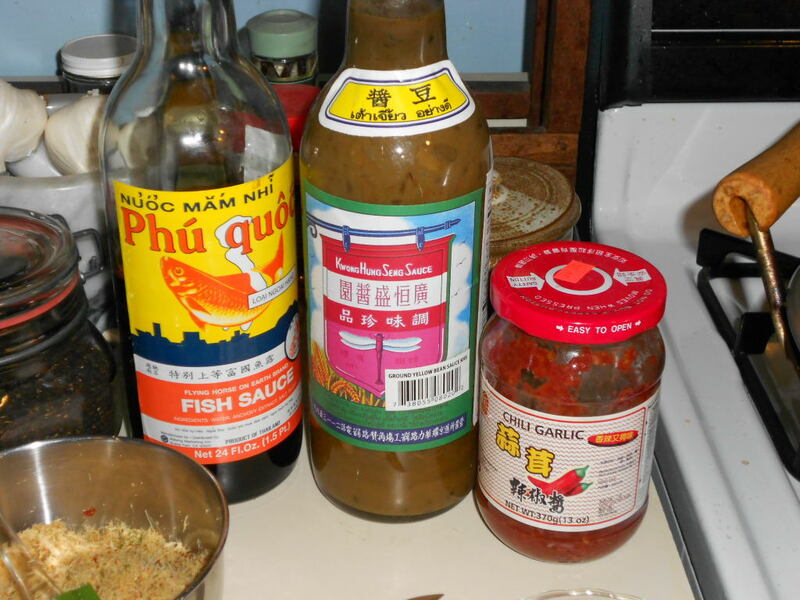 Update: I now make my own Chili Garlic Paste and Bean Sauce (Black rather than Yellow Bean). 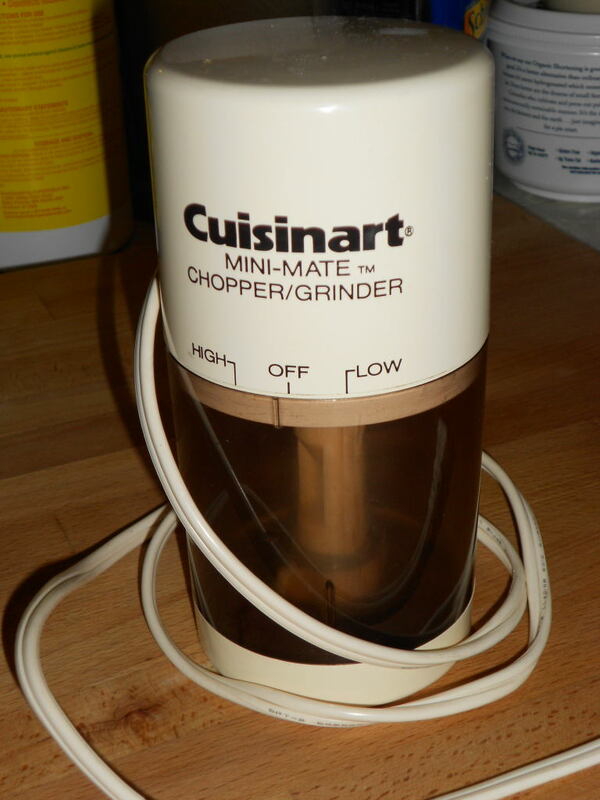 You can find my recipes here. 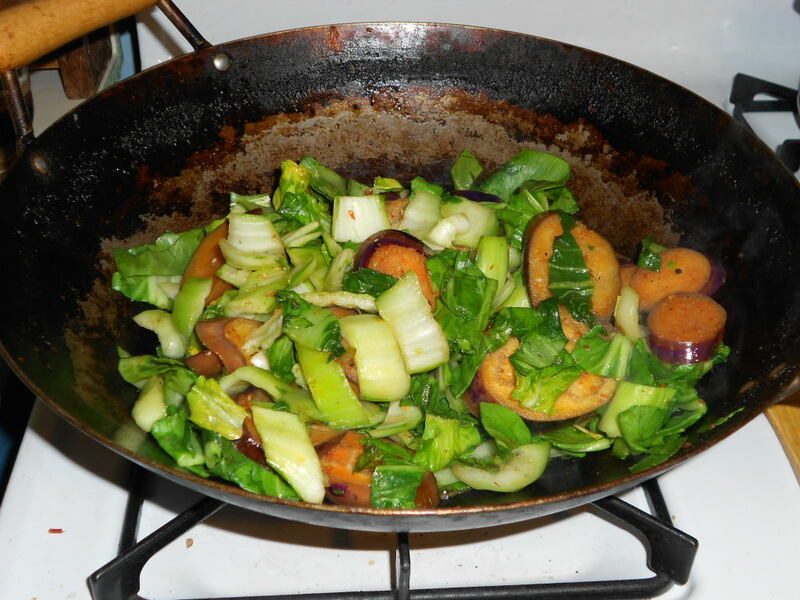 This entry was posted in Recipes, Thai Food and tagged bok choy, chicken, corn-free, dairy-free, eggplant, gluten-free by Highly Sensitive Girl. Bookmark the permalink.